waste time on the computer. These are some Tinkle Time Trainers, made in the hopes of getting BB potty trained. He turns 3 today! So far, no luck. He loves them, and wants to wear them, and will tell me all morning “I’m not peeing or pooing in my underpants!” up until he does and then it’s “Mom, I need a diaper change.” Sigh. They are not waterproof but they are lightly padded, so these accidents will get his shorts wet, but not the carpet. Let’s just say it’s working better than real underpants…that was a mess. So we just made friends with our neighbors, who have a little girl about BB’s age. They were throwing out a doll stroller and I walked over to their house and snagged it from the curb. It’s the first time I have picked up someone else’s trash, and I was a little embarrassed, but it was for a good cause. See, BB always wants to push the stroller if we are going for a walk with LB. 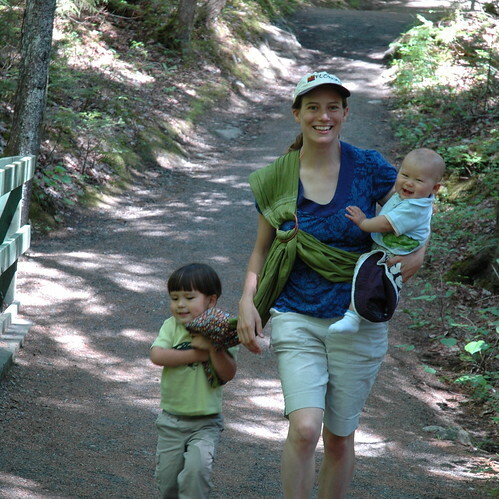 Well, after crashing into this that and the other, it got to the point that I couldn’t take both of them out with a stroller; I carry LB and BB walks. But, I figured that if BB had his own stroller, then he could push his, I could push mine, and we’d all be much happier. So I snagged the old stroller. I don’t have a “before” picture, but the seat was dirty and moldy from being left in the garage, since it was their second doll stroller. But here it is all spiffed up! 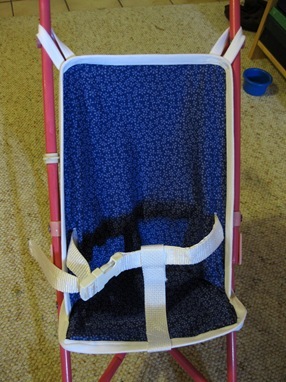 I traced the old seat onto some fabric, bound it up in fold over elastic that I have left over from diaper making, and added this strap from a shopping cart cover. It feeds through 2 large buttonholes in the seat, and it was the first time I’d done a buttonhole on my new machine, and it was awesome. I’m very happy with the way it came out, and even more happy that now we can take our walks in peace. 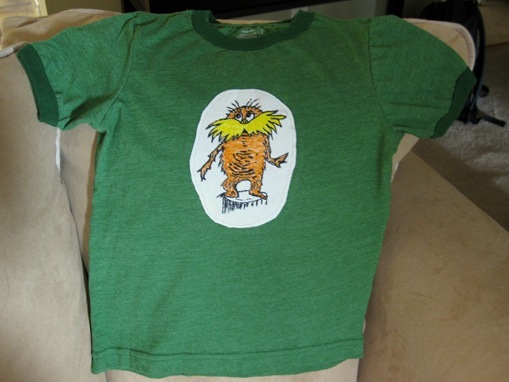 This was a quick one… I picked up some fabric markers from Joann one day when they were on sale, and drew a Lorax on an old undershirt that my husband had sacrificed to the scrap bin. I know what you’re thinking, “Wow, you are talented to draw something like that!” Not at all. How I did it was I printed out a picture, traced in in sharpie to make it darker, taped it under the shirt, then traced it. I will take credit for a clever idea that made it possible though: I made a light box. I couldn’t see well enough to trace just on a table, so I set a lamp under a glass coffee table, placed the paper + shirt on top, and voila! Light box. The tracing was easy after that. Then I just sewed it on an Old Navy shirt. BB loves this too; The Lorax is one of his favorite books and I had been wanting to do this for a long time. He wore it for 2 days straight. 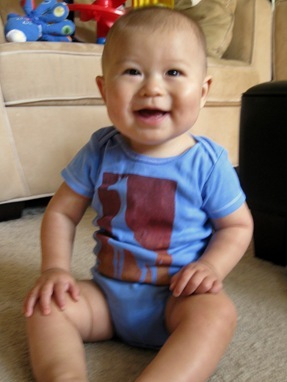 Then I finally got around to trying out this onesie with binding tutorial that I saw back in February (!). I love how it came out! It fits LB like a casing fits a sausage and it’s adorable but I will probably go bigger if I do another one. It’s his beach outfit! So, that’s what’s new around here! 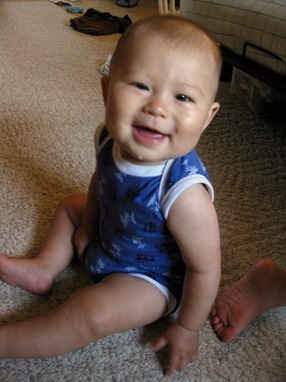 I will probably try another of the onesies with binding; I think it will be much easier the second time around. He will look so spiffy at the beach! I love the Lorax shirt! Great idea.